This Is Getting Old: Clutch Performance! 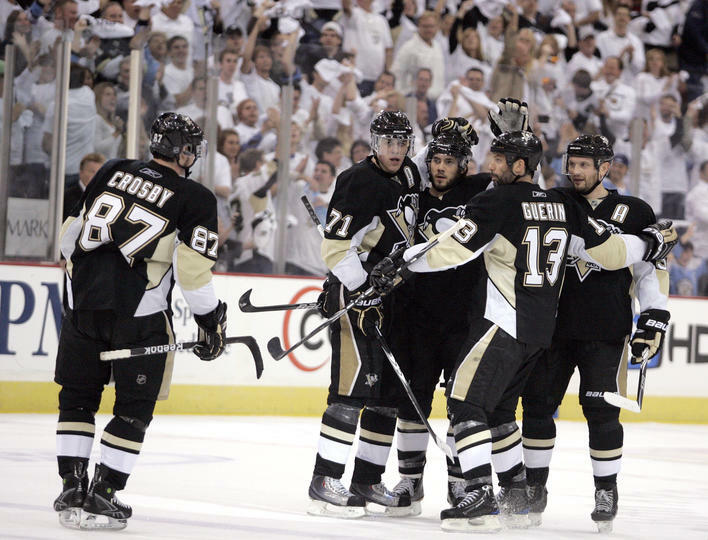 For the Pens, Game 5 was to be "the closest thing possible to a must-win situation without actually being one." It was scrutinized how well they would bounce back after their lackluster ending in Game 4, it was analyzed as to which goaltender would have the better performance, and it was publicized as one of the pivotal games of the playoffs so far. It lived up to all that hype and more as the Pens held off a late charge by Montreal to win 2-1 and move to within one win of the Eastern Conference Finals. Marc-Andre Fleury was superb, stopping 32 out of 33 shots, with the only one he let in being on a play that should have been whistled dead with 31 seconds remaining in the game. Though the goal counted, it would still not be enough for Montreal as the Penguins Penalty Kill and shot blocking came up large in third period. The Pens found a little more offensive success, with all of it coming from the point. Kris Letang put them on the board late in the first with a powerplay goal that was shot so fast that Halak did not see it until the puck was laying in the goal behind him. The second goal was incredibly similar to the first except this time it was Sergei Gonchar who beat Halak midway through the second. This goal also meant the first career NHL playoff point for Mark Letestu, who started just his third career playoff game. Letestu also came incredibly close to a goal that would have put the Pens up 3 had Halak not made an incredibly impressive save. Letestu got the start and the returns of Bill Guerin and Mike Rupp meant for the healthy scratching of Ruslan Fedotenko and Alexei Ponikarovsky. This move was not agreed upon by everyone, but what was agreed upon is that Letestu earned a spot on the Pens roster with his play of recent. Regardless of who starts for the Pens on Monday, they should be ready for their toughest test yet. Now that the series is 3-2, the Canadiens are one game away from elimination and are facing a do-or-die situation. They are 3-0 so far these playoffs when facing elimination, so they know the feeling quite well. This new mentality from Montreal should also open up new opportunities for Pittsburgh, as well. I would expect Montreal to come out more aggressive, rather than their usual "sit back and wait for opportunities" style. This may get them off their guard, and allow the Pens to counter-attack with some shots that they would not normally get against the Canadiens' defense. Fleury will have to continue to be the best player for the Pens, just like Halak for the Canadiens. The Pens will seek to earn their way into the ECFs and the Habs will seek to prolong their season Monday night at Bell Centre. Should be a good one, so don't miss it.